Alano Español is a very large dog of the Molosser type, with a large, strong head. The name of the breed comes from the Alani, nomadic pastoralists who arrived in Spain as part of the transhumance in the 5th Century. Although the breed in Spain is still small in number and the breed has not yet been recognised internationally by the Fédération Cynologique Internationale, examples of the Alano Español have been exported to North America, where a few breeders are promoting for temperament and hunting ability. 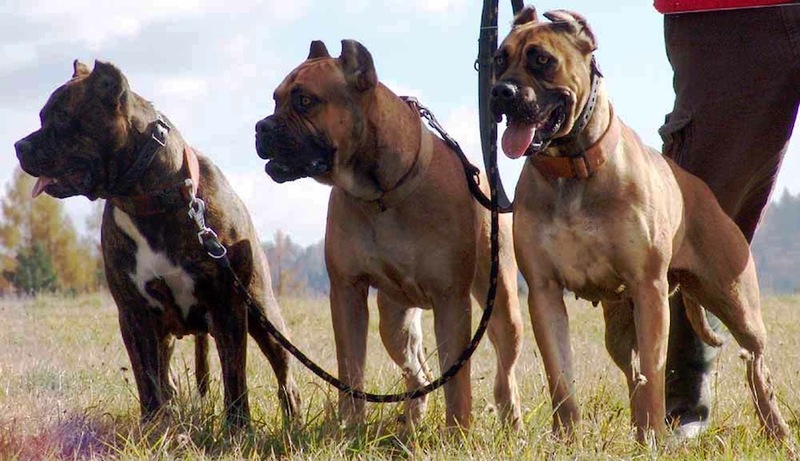 Since the breed was used for hunting in packs, it is very sociable with other dogs. All large dogs must be well socialized with humans and other animals when young, if they are to be safely kept as pets. Large working dogs, such as the Alano Español, need regular training and activity all of their lives. The temperament of the Alano Espanol is very dominant and serious but very controllable by his master, acting submissively toward him/her. The Alano Espanol dog breed is very affectionate with the family and people it knows. It is also extremely patient and good with children. They are reliable, stable, very obedient and bark very little. However, the Alano Espanol will watch strangers with suspicion, attacking with little warning, only when the situation requires it. The Alano Espanol will fight to the death to follow orders. When holding wild animals with its jaws, regardless of the size, nature, or aggressiveness of the animal, the Alano totally ignores feelings like pain or fear and will not surrender until he is told to do so or until he achieves the orders given. The Alano Espanol will fight to the death to follow orders, fighting the wild boar or the bull until the end. They are a fearless, loyal, devoted, hard worker. Well-balanced and stable, self-confidant with a very high pain threshold. Powerful and protective, but not aggressive. These characteristics of the breed are not fully apparent until the animal reaches full maturity, which usually happens when the dog reaches 2 1/2 years old or older. As the Alano Espanol dog breed is bred to function in packs as a team, it is good and sociable around other dogs, enjoying a good romp, playing and just having fun. However, the Alano will not back down if challenged by them. The Alano Español, like all mastiff type breeds, should have a dominant owner who understands instinctual canine behaviors. They can climb trees with amazing cat-like agility and are capable of leaping to great heights from a stand-still position. The Alano can be difficult to housebreak, which makes this breed best as an outside dog. Male Alano puppies tend to chew and be more destructive than female Alano puppies. The objective in training this dog is to achieve a pack leader status. It is a natural instinct for a dog to have an order in their pack. When we humans live with dogs, we become their pack. The entire pack cooperates under a single leader; lines are clearly defined. You and all other humans MUST be higher up in the order than the dog. That is the only way your relationship can be a success. Share your Alano Espanol story. Note: Upload only Alano Espanol picture or your picture with Alano Espanol below - spammer's ip may be blocked.